Want these creepies on your wall? Take a look at the Hilbertonian Posters and perhaps buy one. I take custom requests. 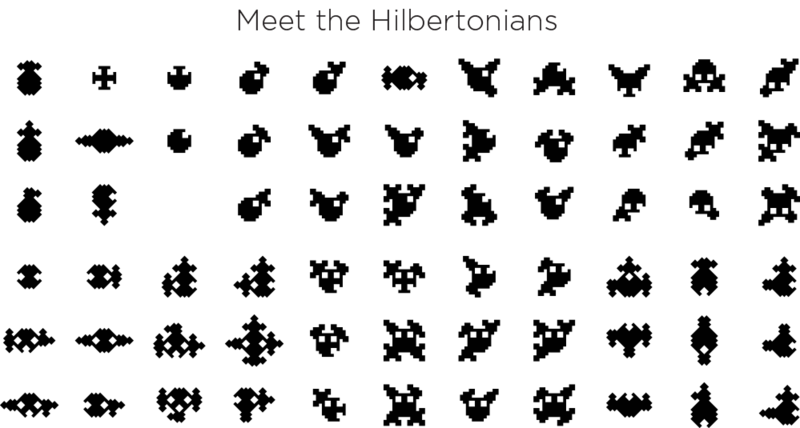 Hilbertonians are creatures that live in the depths of the Hilbert curve. They live across three adjacent orders of the curve (e.g. 2, 3, 4). The come in many different personalities and many classes exist. They are social—they always appear in multiples of 4. This is a consequence of how they are defined. A single Hilbertonian has never been seen. Their genomes are 20 bases long. They only have 2 different types of bases. Out of a possible 220 = 1,048,576 genomes, only 104,976 (almost exactly 10%) produce living and breathing Hilbertonians, defined as those whose bodies form a contiguous shape. The other 943,600 are unfortunately unviable. The genomes of every Hilbertonian can be downloaded.